Dr. Hirani came to Creative to design an ecommerce store for selling Holistic medicines, vitamins, supplements, and essential oils online all around USA. As Drhiranionline provides very good services and medical treatment, the ecommerce store designed had features Services Provided, Conditions Treated, Specialty Testing and online shopping store with information of various products and images online. Creative not only served him with Ecommerce store but did Search engine optimization of his ecommerce website vitahealthessentials.com at national level in USA as well as Local SEO for specific regions with USA. Deliver No 1 ranking on very competitive key phrases of e-commerce website selling vitamins, Supplements, Essential Oils and Holistic Medicines in USA. After the new site design was launched we helped the client through the design process by ensuring they didn’t lose any equity they’ve built in the engines while simultaneously building new content areas and opportunities on the site. We also helped guide their content efforts by delivering detailed quality keyword research and educating them on improved blogging methodologies. Creating an easy and effective user experience for their website through content development. Performing keyword research to develop relevant content, designed to expand their keyword markets. In one year, organic traffic, transactions and revenue all increased. Average visit duration also increased, as well as bounce rate decreased. 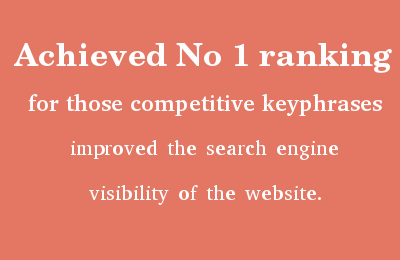 Creative achieved No 1 ranking for those competitive keyphrases and improved the search engine visibility of the website. We gave the ecommerce store an enviable position in Google search results. We made drastic improvements in usability and conversion funnel and made changes that pushed up sales and revenues.